Project SIZE: 1,388 sq. ft.
Renovate an existing corridor to connect to the pedestrian bridge of the Downtown Outpatient Pavilion. The renovation included several flat screen TVs to communicate information to employees passing through the corridor on their way to and from the Queen Street parking garage (accessible via the Downtown Outpatient Pavilion and pedestrian bridge). 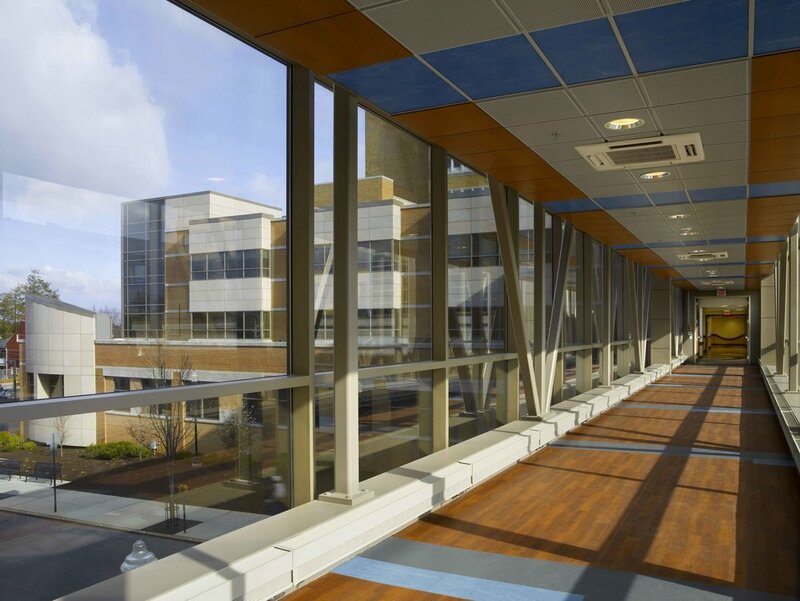 A challenging aspect of the project was to block visibility from the corridor into the Emergency Room waiting below, but allow light from the two story Emergency Room waiting space into the corridor and maintain a rated assembly. This challenge was successfully executed using a patterned glass in combination with the existing window glazing.